How would you act if this happened in person? If someone tripped over your leg or you happened to push them at the post office or at a crosswalk? Despite the litigious society we live in, most reasonable folks would inquire after the other party, “Are you alright?” Covering for the company or your own rear with corporate speak such as “I apologize for having for having to re-accommodate these customers,” and then blaming the victim “…he refused and became more and more disruptive and belligerent” are both neither good nor smart. United’s CEO finally a full day later made this statement, “I deeply apologize to the customer forcibly removed and to all the customers aboard. No one should ever be mistreated this way.” What a difference offering such an apology front would have made! In many ways, Sean Spicer’s apology at the end of a relatively disastrous day in which he made comparisons between the Assad regime and Hitler, was a good example of a timely and unequivocal apology. Unfortunately, in his case, his past flubs and history of misstatements likely undercut what otherwise appeared to be both genuine and textbook case of public contrition. As earlier attempts at clarification by both United’s CEO and the White House spokesperson demonstrated, little thought or deliberation seemed to have gone into their response. In Spicer’s case within 30 minutes, he sent three clarifications on what he had attempted to communicate with his Hitler comparison, with each further muddying waters. This was a clear case of not stepping back before hitting the SEND key. Deliberation does not mean delay or not timely – it primarily means the application of your mind – invariably it means not doing things as a reaction or in the throes of strong emotion. In summary, acting in a Timely manner, while staying Authentic and being Deliberate in our actions is important for our communications to be effective. Think TAD! Culture in organizations has been a favorite topic of mine for many years. The recent discussions of harassment in Uber and Thinkx or the management style of the Trump Organization are all rooted in the underlying culture of these organizations. Most organizations have a vision, mission and even set of values identified – and even displayed in public place. Yet, like many of our own new year resolutions, shall we say, there’s often a gap between what’s stated and intended and the reality employees, customers, and partners experience. So how you build the culture you seek in your organization through a set of values. Dan Rockwell (aka Leadership Freak) whom I’ve followed religiously for several years now, shows a simple yet effective way to put your values into practice. Such a practice will help you build the culture you seek. Here’s the bulletized version of Dan’s method (I’d call it the 3As) that he discusses in the video below. This is a question that comes up with surprising frequency. It’s not just prospective entrepreneurs who ask such questions. “Should I fire him?” is another one I get asked frequently. This is often with a high-performing but a hard-to-get-along employee. As leaders, managers, and individuals we are constantly having to make decisions. Decisions, that all too often don’t seem easy to make. They may have too high a cost – one that makes it daunting, even if it’s a simple Yes or No decision. Some would argue there are no simple decisions, especially when it comes to matters of people or organizations. And when a decision is hard to make, we invariably postpone it. Rarely does such procrastination make things easier. One simple secret to make such decision-making easier, is to separate the what from the when. Try it today and let me know how it works for you. It struck me how appropriate this advice – useful for any person, is particularly relevant to entrepreneurs – who all too often – skip meals, and even if they don’t skip meals end up snacking unhealthily, run around in a high state of stress and all too often are desk-bound and sedentary. If that’s you (it certainly was me), that’s not a really good way to take care of your heart and health. eating healthy in my case this began by becoming conscious of what it is I put in my mouth – my meetings seemed to be accompanied with drinking endless cups of tea or coffee (with large doses of sugar in them) and snacking on cookies (or biscuits). Simply replacing such snacking with a water or green tea made a huge difference. I’ve written elsewhere how eating healthy also helped me drop 15 kgs (33 lbs) elsewhere. being active I’ve begun using a simple 15-45 minute (Pomodoro) timer on my laptop and mobile phone so that I don’t spend 3 or 4 hours sitting on a chair. Additionally, I try to put in between 2-4 miles of walking a day – usually sneaking away at lunch time. Try holding at least some of your 2-person meetings as a walking meeting, in a nearby park – you get some exercise and mind find your meetings go way better. managing stress many of us when younger were like “What me stress?” But whether we feel stressed or not, the every day pulls and pressures of our jobs and lives do cause us stress. Conscious deep breathing, when you take that 5-minute break, walking around, mindfulness exercises or good old exercise are all good ways to manage stress. Of course, one key indicator for me personally is when my snacking desire increases, it’s usually a good indicator of being stressed. avoiding tobacco here’s the good news – eating well, exercising and managing stress are all good ways to overcome habits, that you’d like to lose. Not having been a smoker, I’m hardly an expert in this area. But do what you can to avoid tobacco or seek help to quit smoking. This morning I read Om Malik’s piece on DropBox and how they’ve become the company to achieve a billion dollar run rate in the shortest time – 9 yep, nine years! The Internet might have hastened the pace of our world. The network has turbocharged growth and expansion. However, it looks that growing into business still indexes at human scale. In the early naughts, when we’d meet venture capitalists, who’d ask “How will you become a billion-dollar business?” (my answer usually was we wouldn’t) and subsequently, when I heard young entrepreneurs pitch business plans, I’d often point out to them that average software product company takes 7-8 years to get to $50M in revenue. Yep 50M in run rate. So if DropBox was able to get to 1 Billion in the same time, does that mean the clock has gotten faster? The two operative words here are unicorn and average – an even more important word might be run rate! One way I’ve always thought about it, is despite all the advances in medicine, having a baby still takes – give or take – 9 months. A business in many ways, especially one that lasts, takes time nearer a decade to get to a significant size, on average! In 1988 just as I was about to finish up my Ph.D. and finally graduate, a good friend Murali arranged for me to interview with his group at Intel. My father, who was visiting, insisted on driving down with me to Santa Clara, as he was bored out of his mind hanging around my apartment. I dropped my dad at the Marriott, I think, around the corner and went on to my interview with Intel. I recall Murali’s boss asking me about how a PN junction works and being greatly offended mostly because I flubbed the answer. I don’t recall how the rest of the meeting went, safe to say not too well. In an ego-protecting move, my brain seems to have blanked it out completely. Needless to say, I never heard back from them. It stops you from being complacent I realized that I’d just not prepared for my interview. I’m not sure what I’d thought – that I was a Berkeley grad or that I could answer anything on the fly. The interview that day made me face, how clueless and complacent I was. It makes you better prepared It was not easy to admit to myself, the assumptions I’d made had made me complacent in the first place. Challenging the assumptions was a start but not sufficient. I realized being better prepared was the answer. Of course it took me more than one screw up, to learn this lesson and even today I find I could always be better prepared. It leaves you open for better opportunities Little did I realize that flubbing the Intel interview was not a bad thing, for that’s how I ended up at National Semiconductor. Intel’s enormous success stemmed from their relentless and singular focus on what needed to be accomplished – this translated to new graduates often having to work on a reasonably narrow scope of things, for a good deal of time. That is not a bad thing! In fact, it’s a good thing to focus and go deep but just wasn’t my thing. Guess my inability to do one thing at a time is not a recent phenomenon. At National, they just threw you at a problem, often a big one, and let you go at it – not pretty or efficient, but enormously educational. And if you were interested in something and prepared to put in the hours they were happy to hand it to you. Of course, this may explain their meanderings and lack of profitability the first five years I was there, but talk about learning on the job. Over the last 20 years, many of my successes and particularly my problem-solving expertise was built in those early years at National. They also spent a great deal on educating me on things that I felt then, as unrelated to my job role. This is something that I’m immensely grateful for, particularly to my managers and colleagues who guided me with great patience and fortitude. Of course, if I’d paid attention in school and actually learned how a darn P-N junction worked, I might have learned just as much or even more at Intel, but I suspect given my own personality I wouldn’t have. So despite the disappointment, I felt that day driving back – with my father trying to assure me that he was sure I’d done well in the interview – it all turned out well. And I’ve learned since then rejection need not be bad always. As I’ve heard my wife say often to our daughters, when one door closes, God opens another. This has been my experience and I’m grateful for it. I’d just found out that I’ll be teaching a course on International Marketing (yay!) this coming semester. Once my initial euphoria died, I realized teaching a semester-long (14 weeks) course to a class of 21-year-olds was not something to be taken lightly. Hence the call for help to buddies of mine, who’s been molding young minds for more than two decades. The advice I got ranged from, “Oh, you’ll do great!” (fat lot of good that did) to a 90-minute primer on what teaching a course meant. As always I took profuse notes as my friends waxed. When I went through my notes, one thing struck me – how much teaching a class well, required some of the same skills that any good leader (or startup founder) would need. So if I replaced the words “teaching” with “leadership” the advice was just as useful. Here’s a quick summary of them. Discover your leadership philosophy It’s important to understand and more importantly articulate both to yourself and your teams, what your leadership philosophy is. This isn’t as much what is right – Servant leadership or Leadership secrets of Attila the Hun – as much as knowing what works for you best and sharing it. If nothing else, answer for yourself, why are you a leader and how you plan to go about accomplishing this? Understand your personal style Even leaders who share a common philosophy of leadership can have widely varying personal styles. My own personal style, regardless of the role I play in a team, is one of action – despite my oft-stated intent otherwise. I have seen folks who have a directive even aggressive style be just as successful as those who tend to ask questions and nudge. Recognizing your personal style and how it fits in with your leadership philosophy is important to help your team and yourself succeed. State your expectations It’s important to articulate what you as a leader expect from your team. Whether what needs to get done, or how it needs to get done, stating this will save everyone a lot of grief. The more explicit and specific you are in articulating your expectations, the more likely they will be met. This is especially important when you take over as the leader of a new project, team or company. Build on your strengths & share your experience As Peter Drucker put it “Make strength productive.” Building on your own strengths and sharing your past experience would help you be more successful and will give your team a sense of where you’ve been and lend credibility to your inputs. You need to balance sharing your experience against a tiresome telling of war stories. Recognize people are different A team, whether it’s one you inherit or build, will likely consist of people who are widely different, in aspirations, attitudes, capabilities and working styles. If you have a large enough team, you’ll see something that approaches a Gaussian distribution – even in small teams, especially ones that you inherit, you will see a spectrum of personalities. Recognize this and keep the old adage Different Strokes for Different Folks in mind. You are less likely stumble and get frustrated. I’d love to hear what your own experience has been both as a teacher and a leader. Observe Look at the most effective person in a room – the one who’s surrounded by others and is most engaging. Walk up to them and observe, how they initiative conversation, and how they sustain it. What works for them may not work for you – and even if it did, adapt it to your style. Be a good listener This seems counterintuitive, at least initially. To be a good conversationalist you need to be a good – active – listener. One way to do that is to ask questions – questions that acknowledge what they said, or clarify – open-ended questions so that they can drive the conversation. Observe how they respond. Rinse and repeat. Reverse Questions Often people may start conversations by asking you questions. All of us have met folks who’ve walked up to us and asked questions such as “What is it you do?” or “How do you know the Samuels?” One technique my friend shared was to respond in kind – “That’s an interesting question. I was, in fact, going to ask you the same. What is it that you do?” Of course done right, this will not seem so much a deflection, but an expression of interest. Body Language Conversation isn’t just verbal. When I first came to the US as a grad student, I was lucky enough to have a good friend Marcel (from the Netherlands) who pointed out to me that I tended to not only invade folks private space, but also reach out and touch them, literally. “Not a good idea,” as he put it. Observe people’s body language – of both speakers and listeners, when it’s done right and others respond positively and when it isn’t. Listening while speaking Even when you are the designated speaker, when the floor has been ceded to you, confine your speaking to a finite amount (my friend recommended 30% – not sure there’s a magic number) and get your audience to engage by getting them to speak, whether through questions, responses or other forms of participation. In other words, even when you are “speaking” you are getting others to speak and you get to listen. Prepare Nothing makes you a good conversationalist (or even a listener) as being prepared. Preparation here is not so much a speech you give – as much as having trivia or fun facts handy – be it about the weather (always safe), a sports team, food, pets or current events. I’d hazard into politics or the election only if you know the folks and even then if you want to be invited back I’d stick with safer topics. Be Authentic Nothing kills a conversation faster than being a phony. Evince keen interest in what the other person is saying – this is part of being a good listener but stay authentic. If you are being bored, don’t try to hang in there bravely – your body will announce your disinterest louder than your words. Even if you disagree, you don’t have to argue nor do you have to silently agree. In short be authentic. Now get out there and work the room! Almost three years ago, I shared how I’d lost nearly 35lbs (16kgs) over the previous six months. Whilst that particular piece of good news on the health front, was a result of a diabetes scare, little did I realize what lay ahead. Six months later, I took a sabbatical, started a gaming studio and moved, rather unplanned, half-way across the world. It was the last part that was stressful – of course doing a gaming startup was no walk in the park either. My normal coping mechanism for handling stress is snacking – maybe even binge-snacking at times. So having worked so hard to lose all that weight, I wasn’t going to let two adolescents, a major move that might put the kibosh on my startup and all the uncertainty that came with it, undo it all. While losing the weight proved I had some measure of discipline and self-control, this did not extend very far. So when I got on a plane in Bangalore 250 days ago, I wasn’t exactly confident how I’d do. Today I’m happy to report, for the first time in my adult life, I’ve gone through 250 days – the better part of a year – without as much as a sniffle or a sneeze (both common in Bangalore’s allergy-prone environs) nor an upset stomach, cold, cough or the flu. And at a particularly stress-filled time of my life with a great deal of uncertainty and free time to ponder on it. Here’s how I did it. Daily walks – for 40 minutes – is what I started with, so as to not lose the health gains I’d made. Most days – the wife and I managed to sneak in an additional 30 minutes in the evenings. When I walked by myself I did a sub-15 minute mile, however, the wife and I together did a far more leisurely 18-20 minute mile. I was lucky enough to read my former colleague and friend Troy Erstling‘s humbly-titled post My Epic Daily Routine – which acted as a great inspiration – I adopted several elements and adapted others to fit my own idiosyncracies. So here’s my own daily routine that’s led to my 250-day streak. Two or more glasses of water – soon as I wake up. I go to bed with my 700-ml water bottle next to me and take a swig the moment I wake up. Have also taken to lugging around the water bottle all day and consume 1.5L of water on a typical day. Morning ablutions – use the bathroom usually right after I get out of bed – occasionally in this season of Trump, have fallen into the bad habit of reading election news on my phone while in the bathroom. This is a new source of stress, so trying to lose it. Mindfulness practice aka vegetable-cutting Starting with slicing (yep, slicing) ginger for our morning tea, I spend between 10-20 minute cutting (slicing, dicing, at times pounding) vegetables and fruits for both our morning smoothie and later meals – this is the best stress-buster, a truly meditative and mindfulness exercise I’ve found. Shades of OCD in how small (and near-perfect cubes or parallelepiped shapes that I cut and the color combinations I strive for. But both my wife and I are happy that I do it. 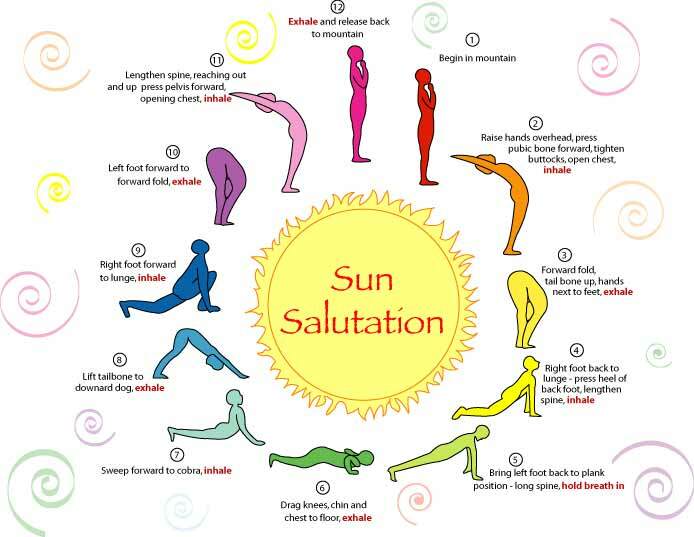 Sun Salutations Troy’s link to this chart, helped me get off my duff to do daily sun salutations, which makes sure that I stretch myself and get a bit limber. The first one is always a little stiff, but after four or five months getting a whole lot better. Anywhere between 10 and 20 minutes. Morning tea – I’ve always nursed my tea (with crushed cardamom and sliced ginger). Use this time to plan my day – at least the burning things that I can no longer avoid. Morning walk – Barring a few days in a month, every day we’ve walked in the woods for not less than 30 minutes but most days 40 mins and cover between 2-2.5 miles in that time. Most importantly for the first time in the 25 years of being married, my wife and I walk together – so it’s done wonders for our communication, creativity, and our waistlines. Eating Right As adherents of Dr. Ronesh Sinha and Rujuta Diwekar dietary principles, we’ve been enormously disciplined in terms of what we eat, which I believe is the primary cause of our present good health. We’ve gone to a very low-grain diet, with quinoa being our primary grain – with vegetables being the largest share of our diet, be it in smoothies (veggies + fruits), soups, chutneys, or sauteed dishes. We’ve been consciously consuming more nuts, fruits (low-glycemic) and snacking healthy with practically no commercially prepared foods. We do consume milk, yoghurt and soy-milk mostly with our tea and smoothies. A lot of grandma’s recipes have been resuscitated with coconut and ghee having returned to our diet, in finite quantities. Our diet (and recipes) deserve their own posts. The only other thing to note here is that we’ve stuck with 5-to-6 small meals in a day – breakfast, morning snack, lunch, evening snack and dinner (usually before 7pm). Sleeping (early) For most of my adult life I was up till midnight before I got to bed. Been consciously working that towards 10pm – not there yet. But trying to put an end to electronic stuff by 930-10pm and read – usually a book before knocking off by 11pm. Again Mr. Trump really tested this routine, as I began watching the TV news – if we can call it that – somewhat obsessively around the debates or when I wanted to avoid doing taxes. Anyway, this is an ongoing effort, but am sleeping early and surprise, surprise, getting up earlier, despite Fall being here and the days getting colder. Yesterday I met the wonderful Artie Isaac, whom I discovered via his blog Net Cotton Content. As with any conversation between men in their fifties, our own turned to the topic of our children, whose stories weren’t ours to narrate we agreed. When it was time to bid adieu, Artie asked me, if he could give me a book – one that might enrich my discussions with my daughters around diversity. Being the shameless book collector that I’m I eagerly accepted his gift of Ta-Nehisi Coates’ Between The World And Me. Later in the day, I found myself nearly 15 minutes early for my next meeting (a very unusual occurrence for me, as most folks who know me can vouch.) I cracked open the book and began reading. Right from page 1, the book written as a letter to his 15-year-old son grabbed me by the throat and sucked me right into it. All evening I struggled as to how best to describe the impact the book had on me. Then it occurred to me that others had been here before – and it was John Keats who so eloquently described his experience of discovering Homer’s work through Chapman’s translation. I reproduce his poem in whole below. Much like stout Cortez in Keats’ poem or Keats himself reading Chapman’s translation, I too was transported to a whole another realm, held enthralled not just by the word picture that Coates painted but by the raw emotion, the immense clarity and urgent insight that he brought to me to understand what it was for a black man to grow up in Baltimore or the South-side of Chicago. In many ways, it brought back memories of seeing Boyz N The Hood back in 1992! As leaders or even just as humans, all too often we lose sight of what’s important. Worse yet, we think we understand things – this book and Coates’ writing style brought me back to the simple insight, that there’s much we don’t know or even if we did, we don’t revisit it often enough to question our assumptions. Knowing oneself, the world around us and the others is an ongoing journey of discovery. Run out there and get this book. And thanks Artie for this wonderful gift!